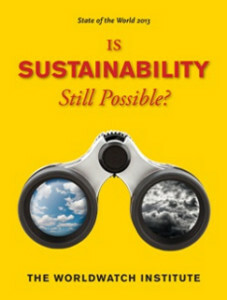 State of the World 2013: Is Sustainability Still Possible? is Worldwatch Institute’s latest in its annual State of the World series. Like other books in the series, each chapter is written by a different expert, and this edition is an excellent combination of thinkers, visionaries and activists looking at sustainability from a number of different angles. It kicks off with a smart chapter by Robert Engelman, the Institute’s President. He discusses how the overuse of the words sustainable and sustainability has resulted in the loss of their meaning and impact. Calling it “sustainababble,” he sets the tone of the book, which “aims to expand and deepen the discussion” beyond what the overuse has led people to think these words mean. Sound disturbing? Much of what Is Sustainability Still Possible? takes on is and should feel unsettling, because it looks hard at where we are versus where we need to be to reach true sustainability. While I wanted to read more about the role of population stabilization in reaching true sustainability, there is a bit of discussion on what is a “sustainable number of us.” Erik Assadourian, Senior Fellow at Worldwatch Institute, asks the poignant question, “Can we have a sustainable civilization while fully respecting people’s freedom to reproduce or consume without limits?” and stresses that “not wrestling with these limits may prove much more perilous.” Will the 2014 edition truly take on population issues, and negative social and cultural influence of pronatalism on these issues? My hope is yes. Like its predecessors, this edition is for anyone who wants to look at deep environmental truths, and is serious about wanting to “live true” when it comes to doing our part for the future well-being of the planet.